Oh Lordy, What A Trip! Im not sure even where to start, well I suppose, its best to start 'in the now'! This blog, Margaret River Correspondent was initially about my experiences in Margaret River and sharing some of the good things that the region has to offer. It did become about my bunions and the process I had to go through to be able to walk properly again, and it has become about 'dogs'! I have nearly had 10,000 page views for people wanting to know where to take their dogs!? I even met some people one balmy evening having a beer at Little Creatures in Fremantle, they had a big, beautiful great dane and there I was sitting there with my little 4 kg papillon, Paris. They said they had just been 'down south' to Margs and had read my blog!!! Crazy! I loved it, some recognition that I was not alone. This blog may transmogrify to include Hashimoto's Thyroiditis. It's the the reason I have not been writing. I think I have had this for most of my life, but with each major stress event or surgery, the condition has advanced. After the bunion surgery, a few things were activated health wise and whilst I had thought, when making the decision to have the surgery on my feet.... 'Well Cath, you realise this is going to be a trip to hell and back", that it was 'way' worse than I had anticipated. But, here I am! I am coming out the other side of it! And yes, prepared for other things to pop up, but, I believe that I can manage it. Christmas Day, apron on, most importantly wearing a big happy smile! At this point I have to thank all the people who have supported me in my life. Not only do I feel like a hypochondriac, I sound like one, blah! Which is the other reason I haven't written. I prefer to share the joy and positive things in my life, and quite simply the 'joy factor' went missing. My family and friends have been amazing! There are no words to express my gratitude and this seems like a pathetic effort. But my heart aches and the tears swell in my eyes thinking of those people who have been there to support me. And, this includes those professional people who have given me the best of their skills, knowledge and integrity. Ok, so now I am ready for the next chapter! I have just put the apartment on the market. So we shall see what this year has in store for me. Little Miss Paris and I journeyed down to Margs to catch up with mates and go to the dentist! Yes, Mark Nathan is a master dentist! It's worth the drive, and what a wonderful excuse for a holiday. Looking south to Hamlin Bay, I could see a very crowded surfing spot further down the beach, no pets allowed in the park, but you can drive your car on the beach. 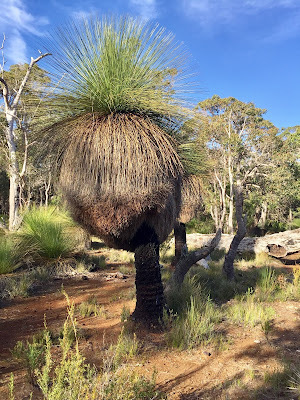 This is a beautiful specimen of a grass tree, we found this on a walk through the bush, and it looked like we were in a place where the kangaroos and emus gather. Lunch @ Olio Bello, they are still good. You can take your own wine or enjoy their selection. Dog friendly. Check out their 'glamping' option to stay. Dinner @ La Scarpetta Trattoria. Located at the bottom of the street in town. We had a Friday afternoon drink at Elkamo and then a casual walk down the main street to La Scarpetta. Also consistently good. I had the 'spaghetti al cartoccio. Breakfast at the Urban Bean, also not disappointed, dog friendly in the main street, my poached eggs perfect, coffee good. 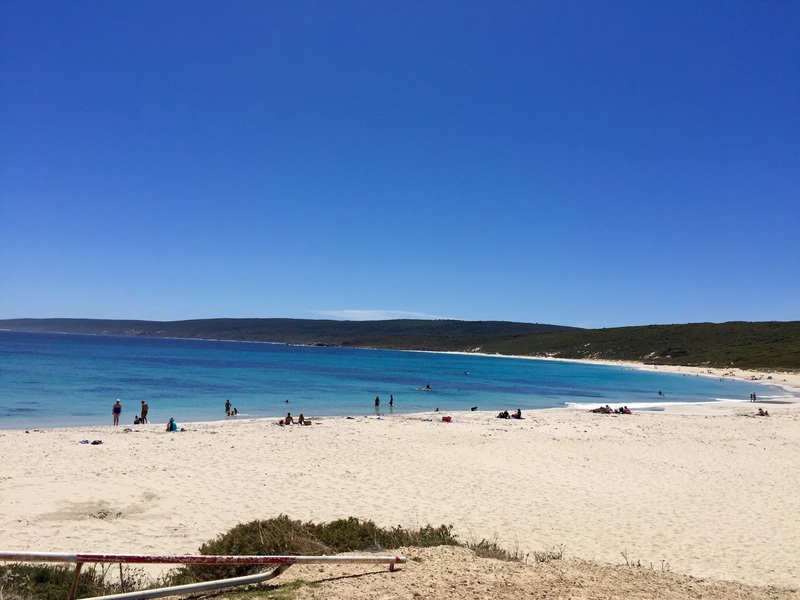 A drive through the Boranup Forest and then lunch at Cafe Boranup. Hey love this place. Dog friendly, comes with the little blue wrens who visit your table. 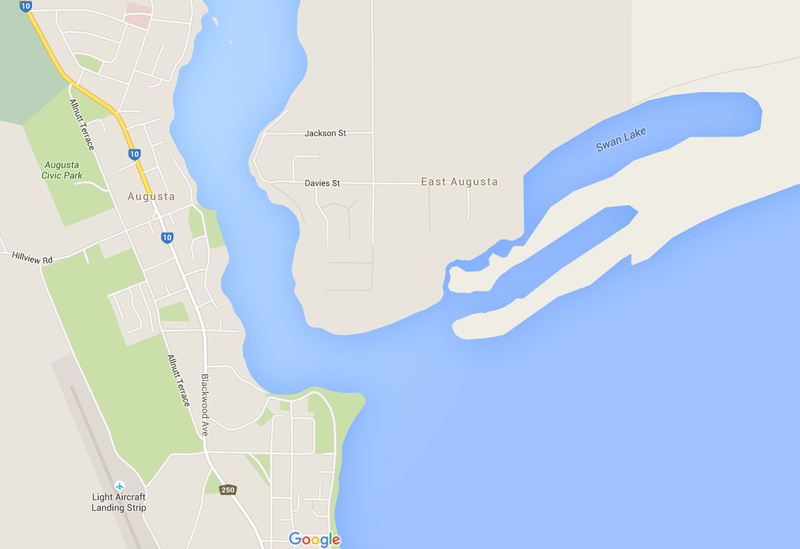 I ordered fresh whiting fillets from Augusta... they were fresh and lovely. I had a smoothie called a Karri-Kale. There is a gallery right next door and full of works from local artists. Saying that.... 'it's a dogs life'.... I am trying to type this with my cat 'Master Ted' laying in front of the computer. He does not mind that I have to lean my left forearm on him to get to the keyboard... oopsie.... a little bit of tail action happening now. So maybe its a 'cat's life'! Prevelly, Paris... just about to be washed off the rocks... didn't happen, but could! I was down there at the end of last year and then again last weekend. 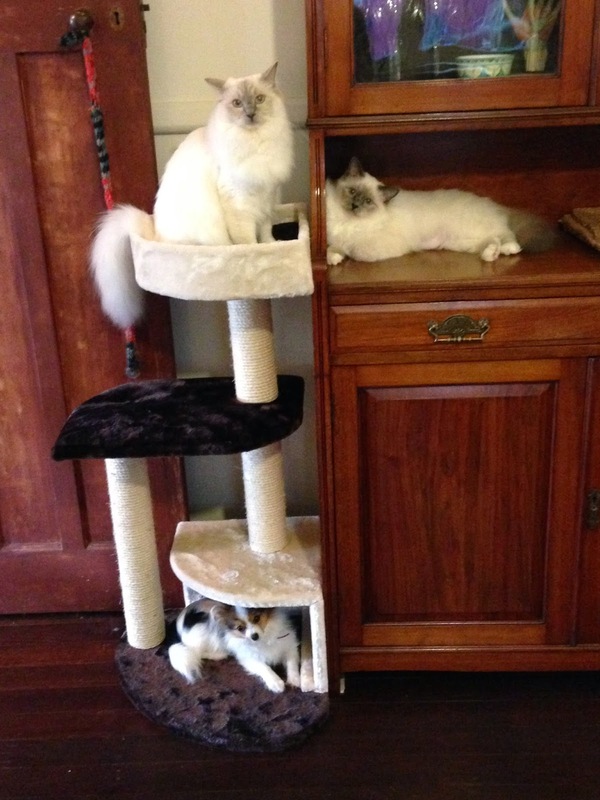 The cats get to stay at home or at the cattery. (Ted has just gone into a full on roll over so that I may stroke his belly) I love to take Paris with me as she is just the best travelling companion. Well behaved in the car, loves stand up paddle boarding, running around in circles in the sand, exploring the bush, she is into meeting people and other dogs and she is just joyful. Im always looking for dog friendly places to stay. Please contact me if you have accommodation or have a review from your own vacation experience. It's lovely that people read my blog, thank you :) I love to receive correspondence. 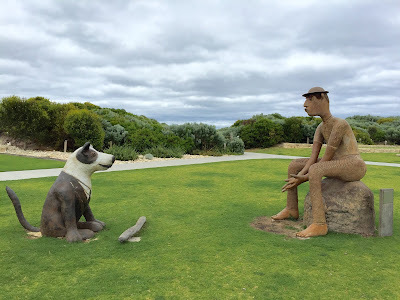 Rosie Burnett from Margaret House wrote to me this week to tell me about her Pet Friendly Accommodation... it looks great and Paris and I will head out to check it out next time we are down that way. Rosie also gave me a link to another new holiday accommodation site that might be of interest to readers, they do list Pet Friendly also. 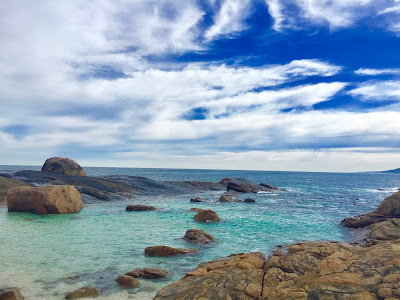 This last weekend was soo magical.... the weather was going to be super hot in Perth, and just 'hot' in the South West. I packed my bags, lashed the board to the car and little Miss Paris and I headed south. I have only just got the knack of tying the board to the car. Where I was going wrong was I was tying it to the roof rails and not the horizontal rails! If anyone knows what I mean. I just couldn't figure out why I couldn't get rid of the humming/drumming!!! Any way, it took my brother Paul and his mate Neil to watch what I was doing to figure it out. 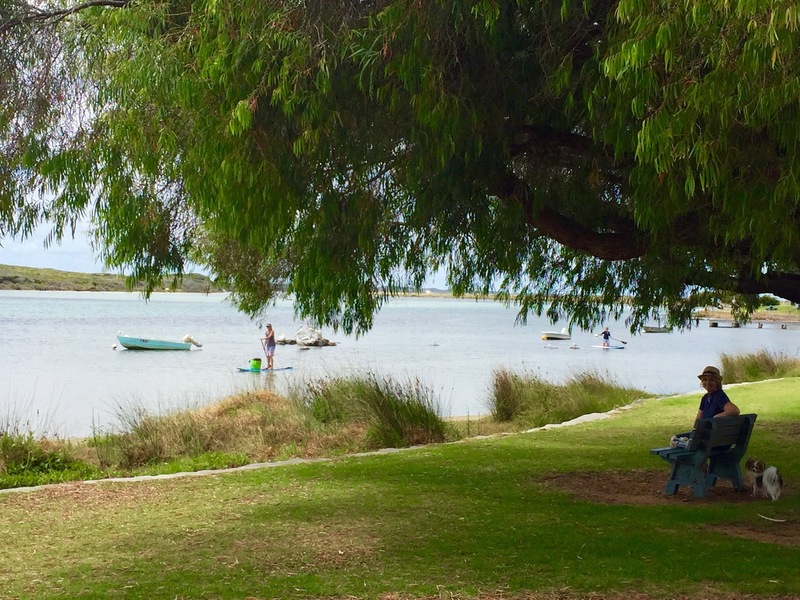 So Miss Paris and I stopped at a great little place for a SUP, its between Busselton and Dunsborough, a place called Siesta Park. I love it. So calm mostly, it is part of Geographe Bay and looks to the North. I often see that the Great White Sharks like to cruise along not far from the shore!!! Paris and I were literally feet away from the beach, we could jump in and run for it if need be :) As I was putting the board on the car, a couple of lazy dolphins were wandering along where we had been. So gorgeous. 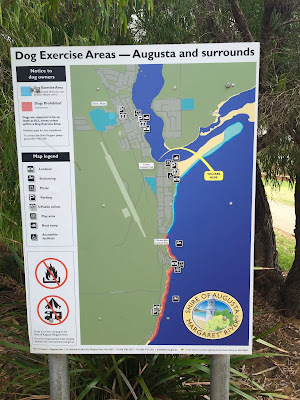 Im pretty sure dogs are allowed on that beach. 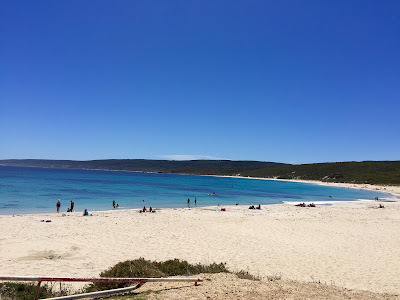 This is Smiths Beach.... oooooh la la :) What a beautiful day, what beautiful waters... it was absolutely stunning! As we were driving down the hill we could see the helicopter perusing the bay... they would signal if there were sharks. 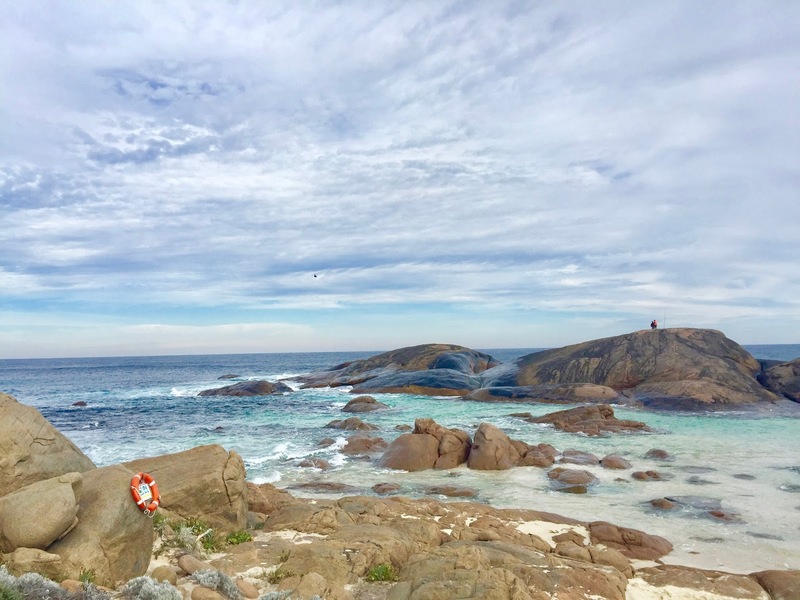 And, let there be no mistake, this whole South West is on the Great White Shark route, north and then south following the whales. 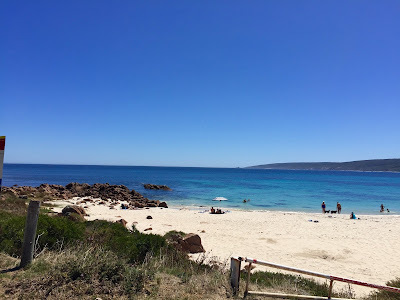 My attitude is that, there are heaps of sharks down there swimming past me all the time.... Im still alive!!! And mostly, Im as close to the shore as possible :) Yes Im chicken, but they are beautiful and scary! My paddle boarding mate.... Marian, that is not Mate Marian, that is my mate Marian :) (sorry I crack myself up) Sorry, she and I paddled out along the beach and over the little reef in the distance. Maybe a little wave for beginners in the right conditions. 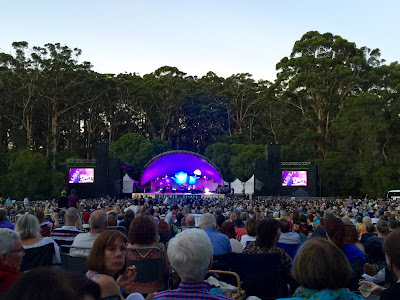 Ahhh.... woo hoo... we got tickets to my very first Leeuwin Concert, and even more woo hoo, it was Chris Isaak's, Thank You Kristen, Jane and Marian for organising, what a wonderful evening, perfect weather.... great friends, wine, entertainment. So much fun. Next day: The dirty & happy Volvo :) She's all packed up for a paddle down at Augusta. If you look hard you can already see little Miss Paris already to 'rock and roll'. I digress.... you can take your dogs down to the river shore. But in this section where we took the boards off, which is near the caravan park, they do need to be on a lead. 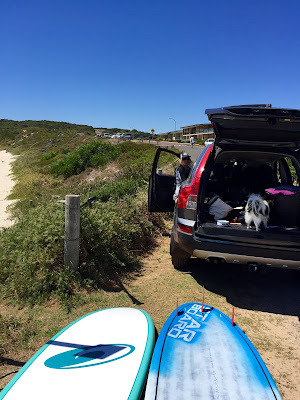 Paris loves being on the board and as I was still getting my board ready, she followed Marian through the shallows and literally jumped aboard her board :) I so suggest anyone to go for a paddle down there. The water was clear, lots of smallish stingrays and the sun was shining. Mind you the wind was blowing and when we got to the other side and walked across what is now a little island, the tide was ripping through the cut... we met a couple on Kayaks and they said that the tide was about to turn. So if we didnt get back to the other side soon, we could potentially be sucked out to sea! Sooo... we paddled, paddled, paddled and paddled harder, we were heading into the wind and had to cross the tidal current. Marian did it ever so well. I was a little nervous as I had Little Miss Paris on the bow. I sat down and paddled the board like a kayak, Paris sitting tucked in between my thighs. If we went over, as in fell off the board, we would be in trouble. This map is not correct... and it is dangerous information for anyone taking to the water. Google Maps again, thank you. This is more like it. Just a note for visiting dog owners.... please beware for your dogs! Paris came home covered in little Pepper & Salt ticks, they are itsy bitsy and actually really hard to see. Her flea treatment usually handles this, but I havent used it for ages as I dont like to dose her up with poisons unless there is reason to. This worked almost instantly, although a couple were more persistant. Do your research first before trying to take ticks off yourself or the animals. Also beware of shallow, warm waters, especially where you find lots of sea birds. There is a thing called Pelican Itch or Swimmers Itch, Narrabeen Itch etc. Mostly caused by parasites that target birds. I know that the research is about the effects on humans, but just think about what it does to your poor pooch! Dont forget to wash you and your faithful companion down with fresh water immediately after. I didnt and had almost 2 weeks to get the poor girl back to no itchy scratchy! I can highly recommend Wills Domain. I went there (again) recently for my friends birthday lunch. The day was late winter, not a leaf on any of the tortured timbered vines. The last of the winter clouds wafting in from the sea and across the landscape, eucalypts and vines. Looking down to the Gunyulgup Valley, the sea further on and visible on a sunny day. The restaurant is located closer to Yallingup. So quite a drive from Margs, about 40 minutes. 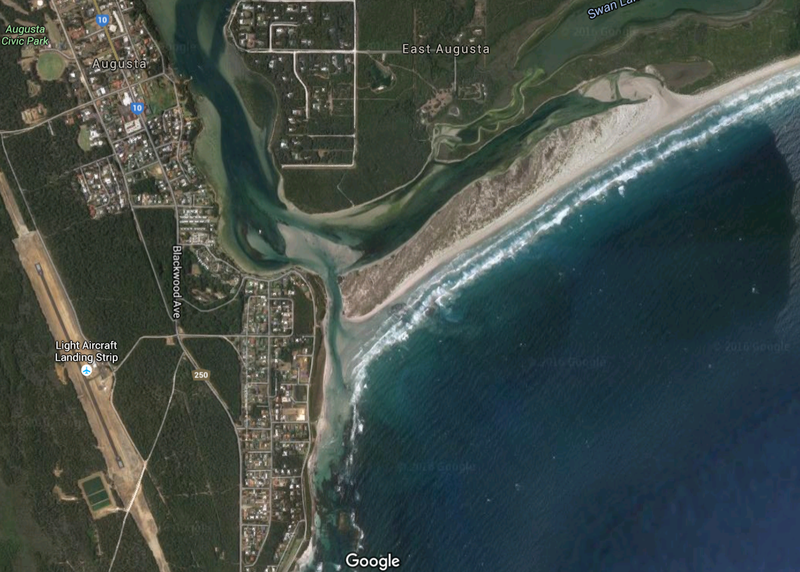 Or, you can fly in by helicopter, as Twiggy Forrest did when I was there this time last year. Just contacted Wild Blue Helicopters and they will fly you there..... now there's a thought! Kel's Designated Drivers are also an option. We just love their cuisine. For starters we had Beef Tendons with Tasmanian Pepper..... yuuum, puffed up like a Chinese prawn cracker, didn't even resemble a tendon?! Im a mad kale addict... we had the Kale and Wattle chips.... that's just the starters! 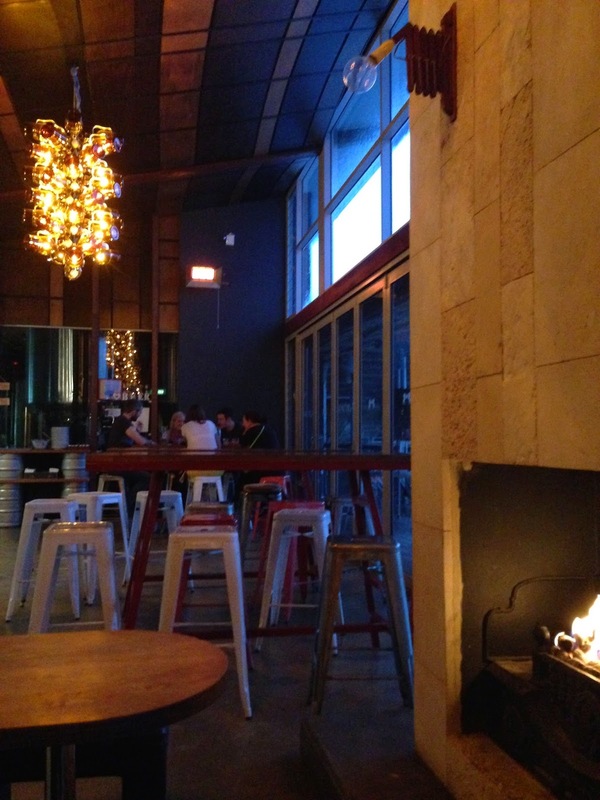 The service at the cellar door was smiling and eloquent. Our thing is to try their wines before we order out meals. We tried them all. As much as I love children, avoid those high traffic times in school holidays. Ask the question when booking. Also one of my regular favs. It's a great place to take visitors. They have fabulous tastings of their delicious olive oils. There are many beautifully presented and packaged gift ideas. Take home sauces for an easy meal after a hard day of wine tasting and vineyard visiting. I took along little Miss Paris and she was very happy under the olive trees with us. I tied her to my chair and the cheeky monkey untied herself. I had a good look around the property and it would be a fabulous place to take a big dog with you for lunch. There are some tables out the back that are away from the main eating area. It looks like the tables have not been used in a while but its worth a think because the venues for bigger dogs is quite limited (remembering that they must all be on leads). This is the perfect location for a big dog or two (on leads of course), there are sheep at the end of this avenue of olive trees. At Olio Bello you can order fabulous pizzas and pasta's, I ate all of my prawn pizza when I should have only have eaten half!!! You can take along a bottle of wine of your own or buy theirs. I tried their wine by the glass which was very pleasant. I noticed that they are also selling beer. You can have tea, coffee, cake, ice cream. Have a little picnic with the kids and grandies, perfect. You cant see them from here, but there are sheep down the back there. This is not the Rails to Trails! 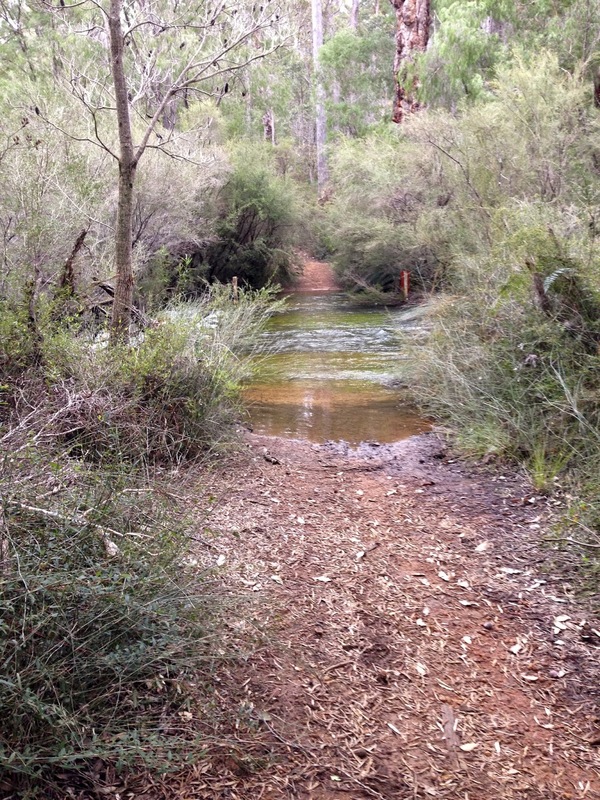 But it is a walk I embarked upon a couple of weeks ago and I was only 5 mins into it before I realised that I wasnt going to be able to cross the creek (which I think is Margaret River!) 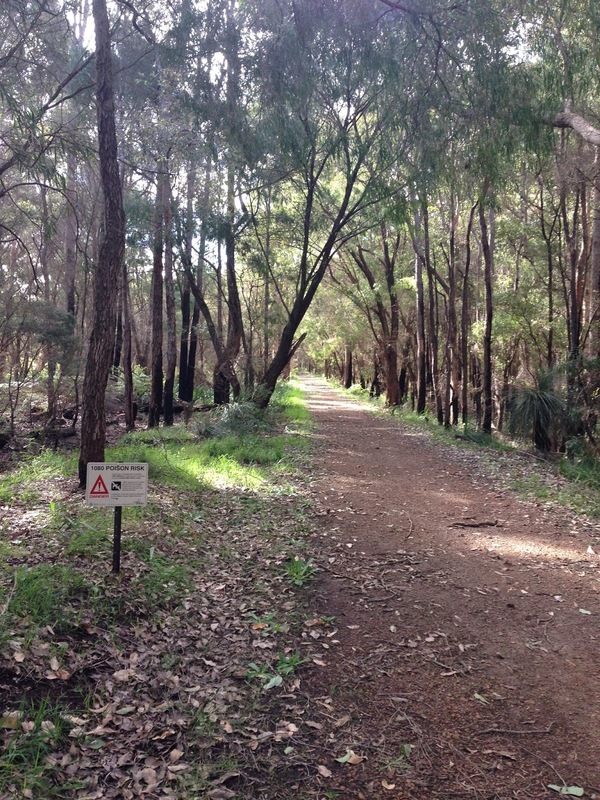 So I went back to the Rails for Trails :) Was a bit boggy! I can't walk the entire length of the trail (yet), so I have been starting on different roads that cross over it. Doing the research, the length of it varies between 13.5kms to 15kms. 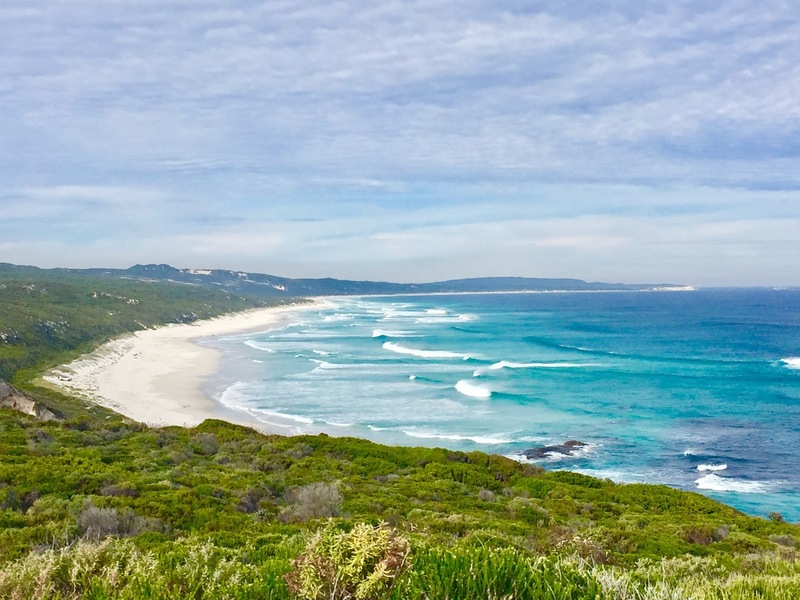 Basically it starts from Cowaramup, heads south through Margaret River and down to Gnarawary Rd near Leeuwin and Voyager Estates. So I walk for about 15 minutes one way and then back again. Or longer depending on the feet. You could count them all as separate walks as they are all so different. I will write more about these walks later. But some of these photos are part of a post I am compiling on walks. 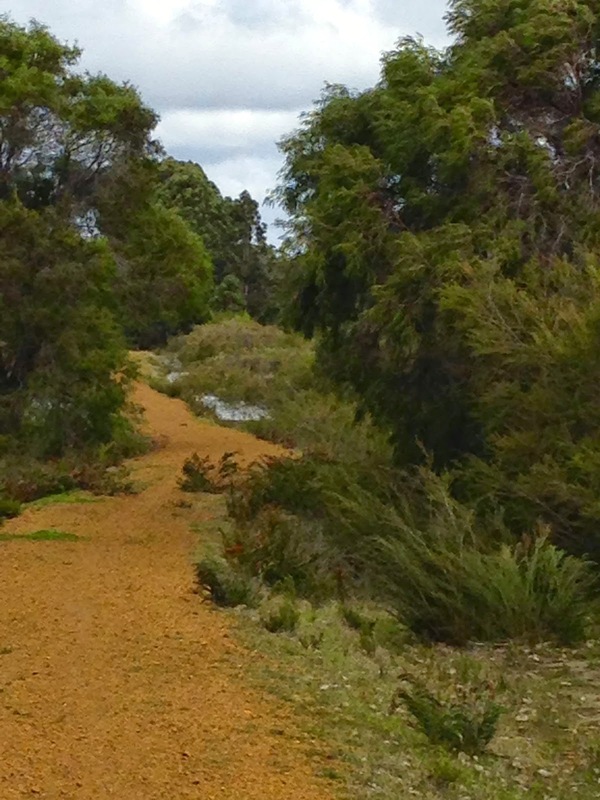 RtTs From Burnside Rd, North, very boggy and note the 1080 dog poison sign! Yes have written about them before. And have been there twice in the last month. First was a meeting for the Creative Corner, a group that was formed by The South West Development Commission and has generated the Emergence Creative. They are forming an environment for South West 'creatives' to come together. So we had a meeting there one late afternoon. It's about 20 minutes out of town. Summer time they have a bus to and from Margs. The beer is fabulous and I have always had what one would call... 'good pub food' there. After the meeting members were joined by their family and stayed on for pizzas. I had organised Kel to pick me up. Not wanting to drink and drive. Yep.... and then popped in one wet and windy afternoon after my walk along 'the rails for trails'. The sun had an hour before setting, it had been wild and wooly all day, just managed to dodge the rain for my walk, and as we walked in we were greeted by a lovely warm fire. As I was enjoying a glass of pale ale, I could see the tree's outside become a little more animated than they were before, I could tell we were in for a decent gust.... sure enough, in the safety of the brewery, it was blowing a gale outside, it swept through taking with it the chairs that had been neatly stacked on the tables and the gas heaters. Your 2-year x-ray looked just fine. There was no sign of any deformity recurrence since your last x-ray one year ago. It is no surprise to us anymore since we are virtually still looking for the first case of failure of the intended new ligament by our surgery after over 1,000 cases. It is how good of healing power of one's own body or the nature. Our patients have challenged it with all sorts of sports and high-heels without failures. 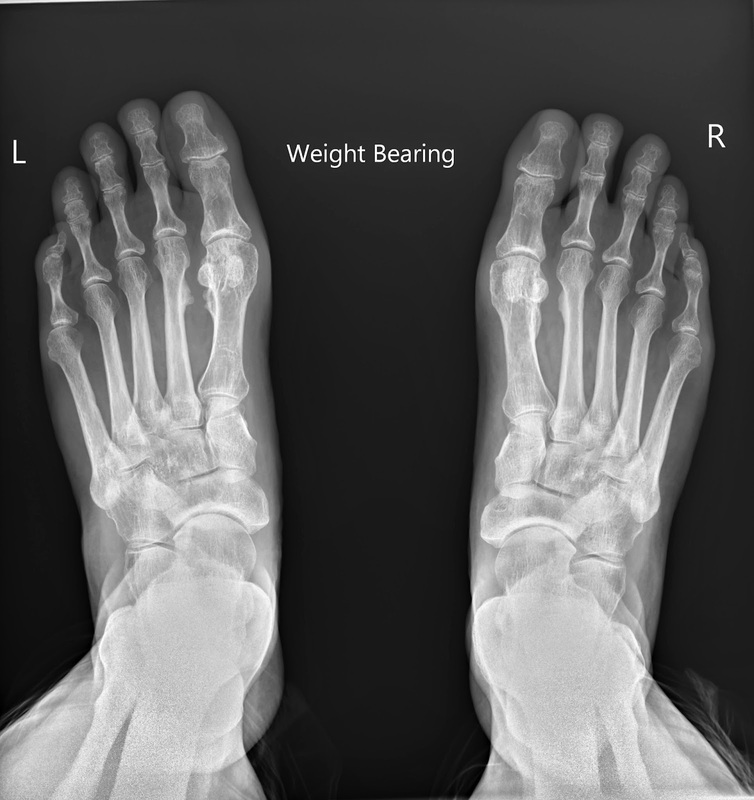 Mild discomfort may happen in different ways in each individual case but not usually due to anything serious, except possibly some remaining internal scar tissues from the surgery or mild joint cartilage damage from previously prolonged bunion deformity condition. Certainly, I cannot imagine your feet becoming disabled by doing normal activities. I read your blog with envies of a happy person. Your next scheduled x-ray is in three years or five years after surgery for a grand finale of proof of the surgery. Well, had my new xrays taken last Friday. I have been holding my breath. Whilst I am wanting to have the utmost faith that all will be good and I will not suffer my Grandmama Madeleine's fate, of having the operation not be successful and the feet revert back to bunion status. I can't help but hold that scenario in my mind as a worst case for me. One has to be prepared. But.... Yahoo..... so far so good! The xrays are fabulous. I am so relieved. My feet feel strong, although a little 'creaky' when I first get out of bed... but hey, so does the rest of my body. 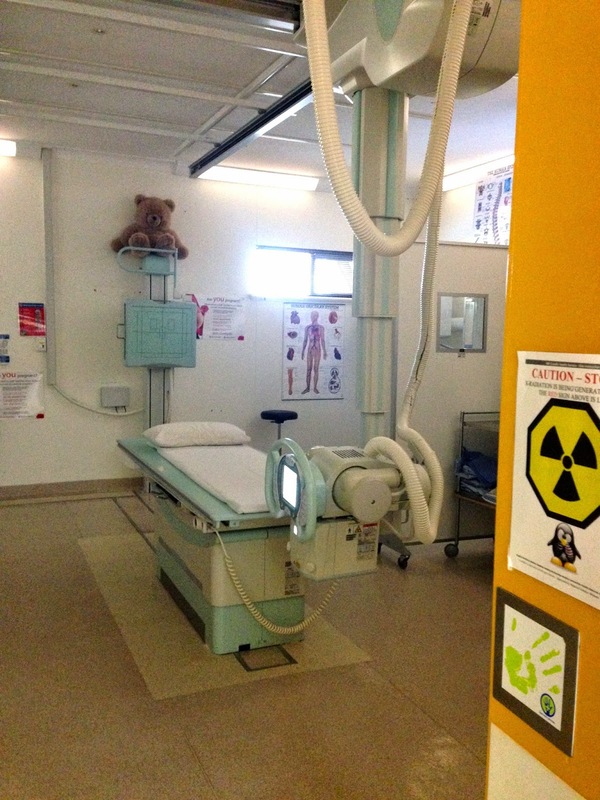 This where I get my Xrays in Margs, the xray should be 'load bearing', meaning I should have my full weight on my feet, but its very hard with this machine to do that. I have been doing a bit of gardening and can feel that has had a stressful effect on my feet. And I have been pushing it with the walking, adding more distance and more speed. 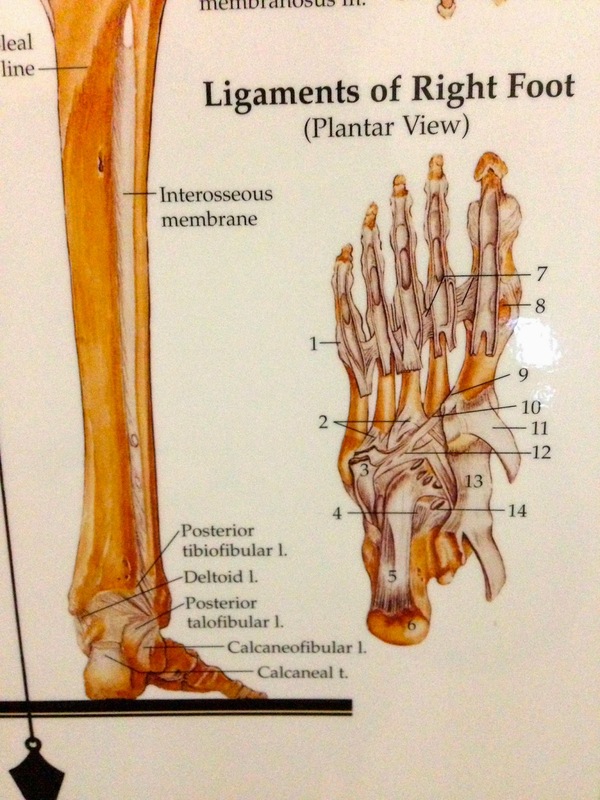 I saw these charts in the xray rooms, illustrates the ligaments quite well. Dr Wu would most likely laugh at my hesitation of stressing my feet, and of my fear (I assume). He has a better sense of what feet can do. But I have lived with the thought of being crippled by feet that don't work! And, endured the entire ordeal. I read a great book a long time ago, which for the life of me I can't remember the name of, but it was a compilation of stories about shipwreck victims. And, a common cause of their eventual demise (if they were not rescued) was that their feet would let them down. When washed ashore, they were either forced to eat their shoes, or their shoes were destroyed, they then had to hunt for food. Not an easy task when you think about it. The feet got cut on reefs, rocks, bushes, they were bitten by insects, snakes, animals (or worse.... when eating their own toenails they got a bit excited and bit off a bit more than they should have.... sorry, true but my sick sense of humour... should have left that bit out)! The feet eventually got infected and..... you can imagine what comes next. Down they went. Unable to walk or run, they could not hunt or forage to feed themselves. That story has stuck in my mind, and I just keep thinking of how I would survive without the use of my feet! The vege patch, I am starting to get ready for spring. The last seedlings I planted were eaten by the rabbits! And the Quenda and the slater and slugs.... hence the new fence. The old one nearly killed me when I stepped over it, the hem on my pants caught on the wire and I went flying... that happened twice after the operation and I then took the fence down. In this day and age we are so lucky. I suppose I could have prosthetics crafted like Oscar Pistorios. And, actually I hadn't thought of that until just then. It is a viable option. That thought is uplifting. So, we have choices. And, thank you God, I seem to have made the right one. I think after two years, if there was going to be a reversion we would start being able to see some sign of it. 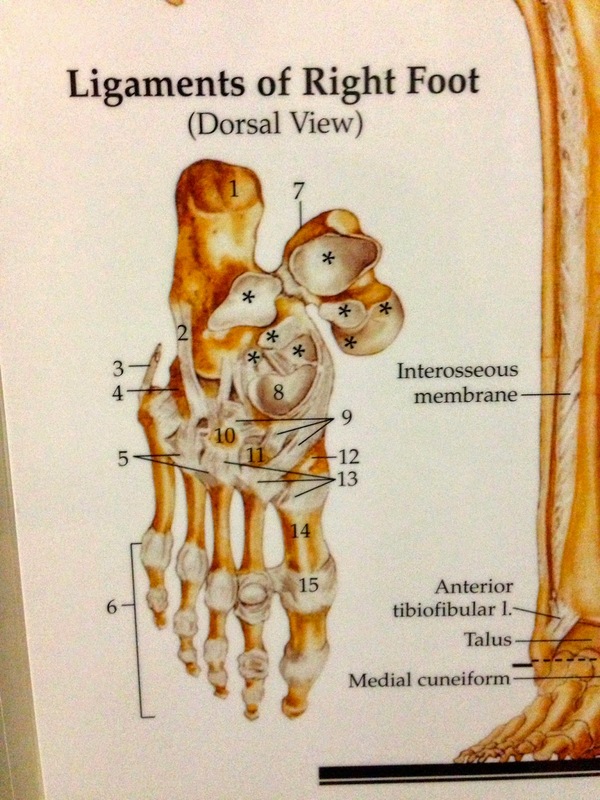 Apparently there is no arthritis in there according to the radiographer. Thank you God again! I love this lemon tree, I have bought it back from near death and the lemons are divine. Re: people eating their own shoes to survive.... I found this story of the.... Lady Franklin Bay Expedition, written by Cristina Rouvalis for the Carnegie Museum of Natural History. It was one of the 'nicer' stories written about that kind of survival. Don't read it if your squeamish. The rain is belting down on the tin roof of The Shack'ette. The wind howling through the trees. Driving out for a walk along the beach proves impossible as I have missed my opportunity to walk in the sun. The sky merges with the waves and it's a whiteout. Our little river that is Margaret River has broken free at the river mouth, and the Peppermint Tree stained water escapes to sea. Little lambs are nudging Mum for a bit more milk. 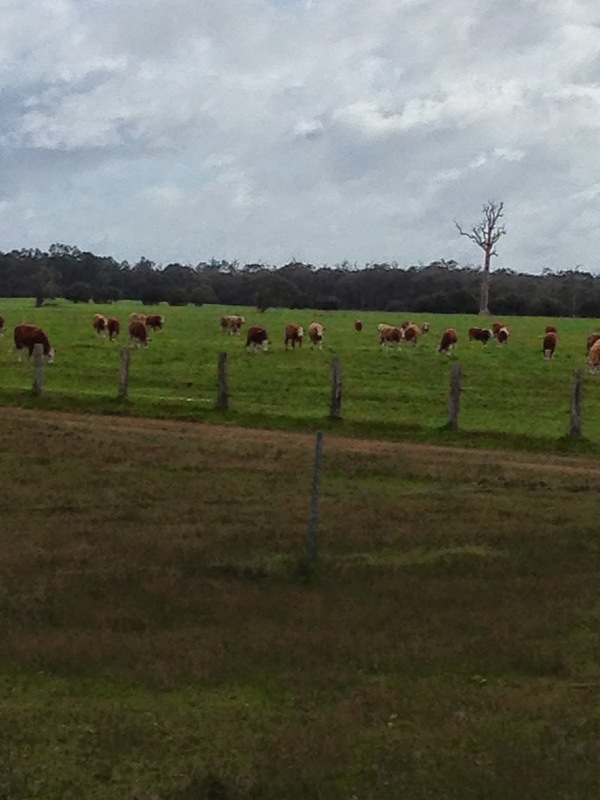 The cows are gambling across the lush green grass. Ducks nibbling their way through the creek mud. This is the time of year when surfing opportunities are scarce. Im not in the mood for stand up paddle boarding as I hate the feeling of cold rain dribbling its way down and into my wetsuit! Although, it is sensational to paddle up the river in the mist.... but... Im a bit soft. The kite boarders are anything but soft, they are out in numbers taking advantage of this wild weather. But, it is absolutely perfect weather for wining, dining and enjoying the company of my mates. I recently started to plan some upcoming events. And was wondering about transport logistics. I wanted to go to the recent Creative Corner meeting at The Colonial Brewery. Had a dinner coming up at friends who live in the countryside on a farm and I also wanted to take Paris, my dog. And, then there was the Gourmet Escape coming up in November. Drinking and driving is not on. And, I do not want lose the opportunity to enjoy our local wines. 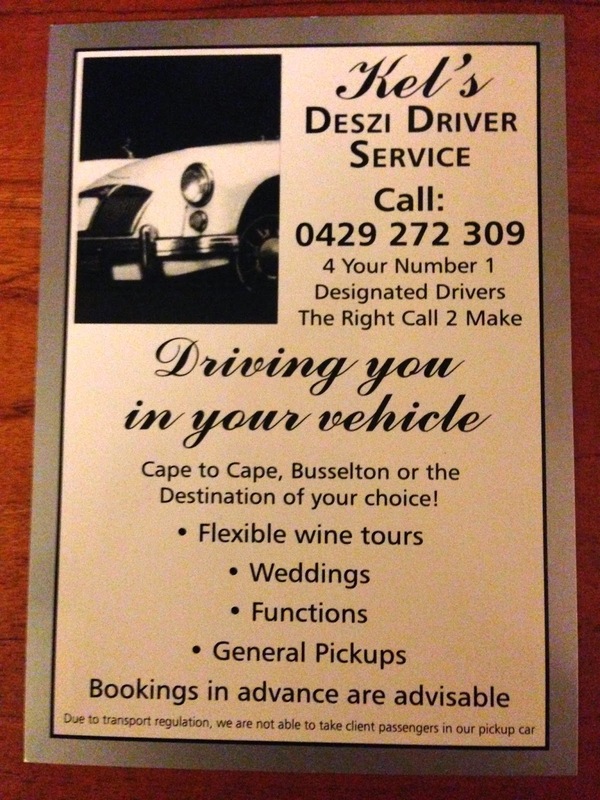 My logistical solution was to call Kel from Kel's Deszi Driver Service. This is where you can drive your own vehicle to the venue and then Kel (your designated driver), will arrive at a prearranged time with another driver, and drive you (in your car), with your companions and even your dog, home, safe and sound. Her driver follows behind and picks Kel up when you arrive at your destination. After using Kel's services for several years, we have got to know each other and today she invited me out to Brookwood Estate. What a wonderful idea, a girly lunch on a winters day! Even on her time off she was restrained enough to just have a little sip of wine at the tasting room. I of course was not so restrained. I got to try a little of their champagne, and each of their 4 red wines. I chose a glass of their Cabernet Sauvignon to accompany my lunch. Melt in the mouth Gnocchi, just look at that Manjimup Truffle! 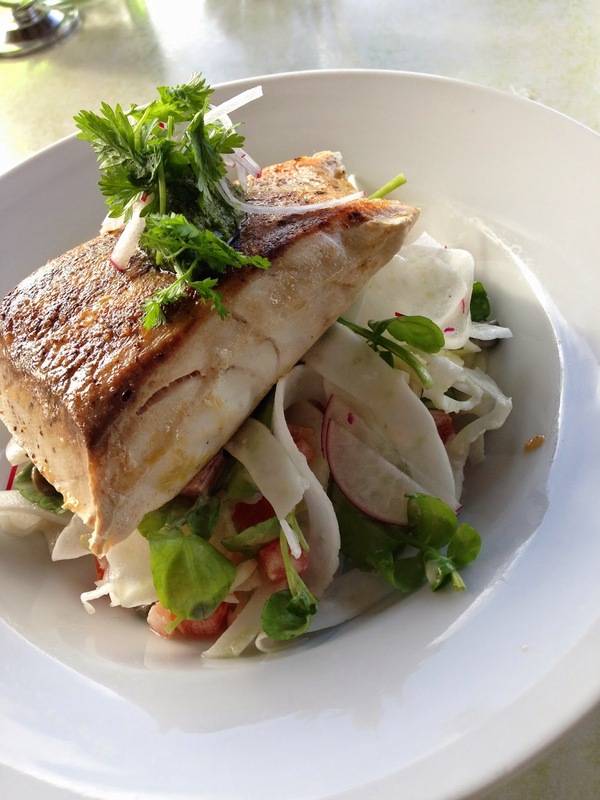 The Augusta Pink Snapper... again, melt in the mouth! For our mains we shared the Augusta Pink Snapper and the pan fried Gnocchi with Manjimup Truffles...... OMG yumm! Thank you Kel, thank you Aven and thank you Brookwood. It was a spoil for me today. Kel did all the driving, Aven indulged us with his culinary expertise and Brookwood graciously paid for my lovely wine at lunch (not to mention making it). I could not resist buying a bottle of the 2012 Cab Sav to take home. Apparently it will be even better in a couple of years... I don't think it will live in my cellar that long.